We have lived in our home for almost 9 years and we have finally focused some time and energy into sprucing up our front entry. With getting married and having two kids, a lot of our home updates were tossed to the bottom of the to-do list. Not any more! 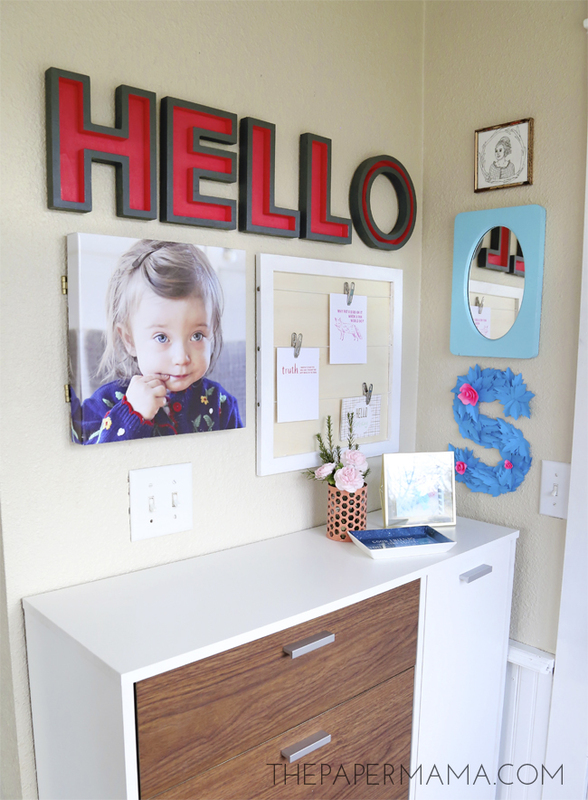 I recently spent a bit of time fixing up this tiny space to make it more welcoming for us when we come into our home. Our entry is pretty skinny and we didn’t really have much room for any large pieces of furniture, but I still wanted something to hold random things, keys, and possibly shoes. I found this shoe organizer online and it was just skinny enough to fit in this space. Since this is the first spot and last spot we see when we leave, or come home, I wanted a little note center. 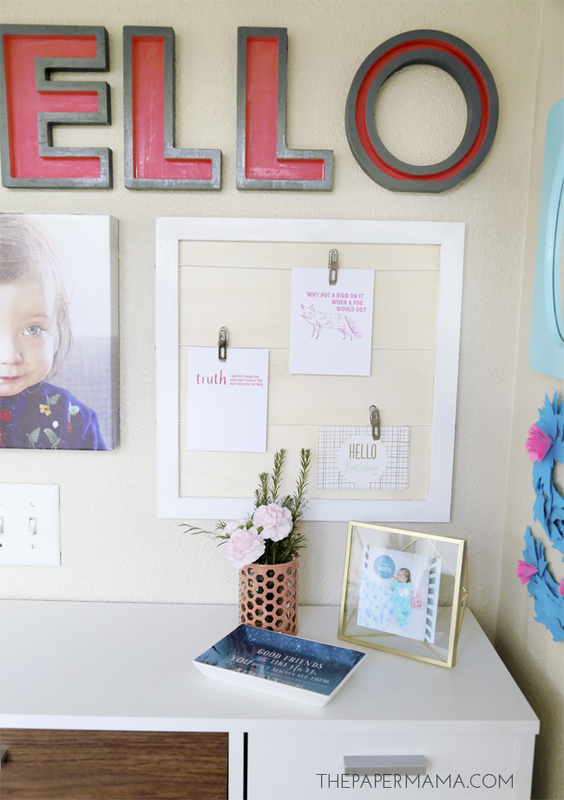 I needed a spot to collect any reminders I might want to hang for my husband, or a place to hang cards we receive in the mail. I found this cute unfinished note hanger at Michaels and gave the frame a bit of a makeover with some white paint. I removed the rope hanger it had at the top and instead attached it to the wall with Command Strips (I hang almost all artwork in my house with these things). Next up I hung a mirror to check my makeup before I leave, one of my illustrations, and my paper floral “S” (find the tutorial to make that monogram floral letter here). The photo canvas of my daughter has actually been hanging up there all alone for quite a while now. It is on hinges and covers our alarm panel (there’s a DIY on how to do that here). The vase is actually a pencil holder (found at Michaels) that I put a jar full of flowers in. This space definitely needed more color, so I wandered to Michael’s to check out their new Alphabet Soup by Make Market™ line. 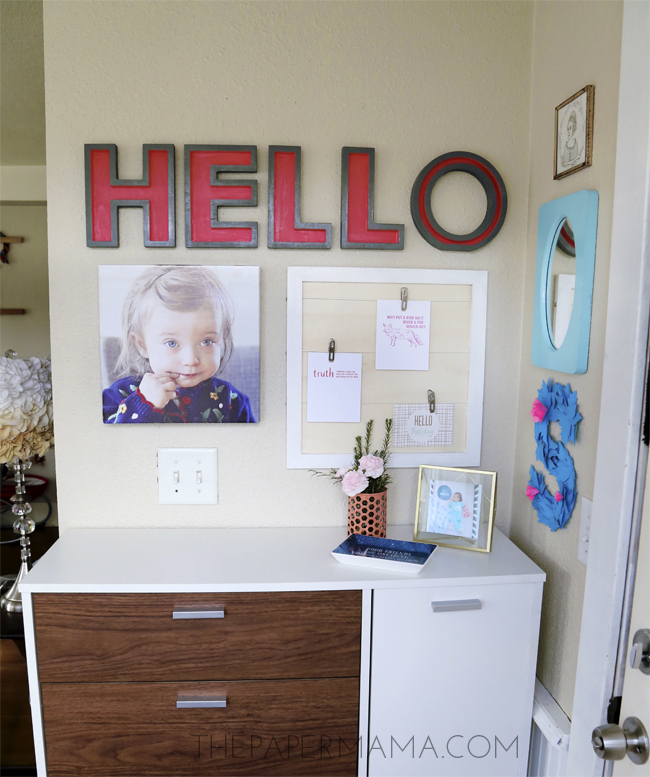 “Hello” seemed like the appropriate thing to hang in an entry. I used this grey Americana Maxx Gloss paint for the outside section and this pretty coral paint for the inside. When they were all dry I attached some command strips to the back of each letter to hang on the wall. 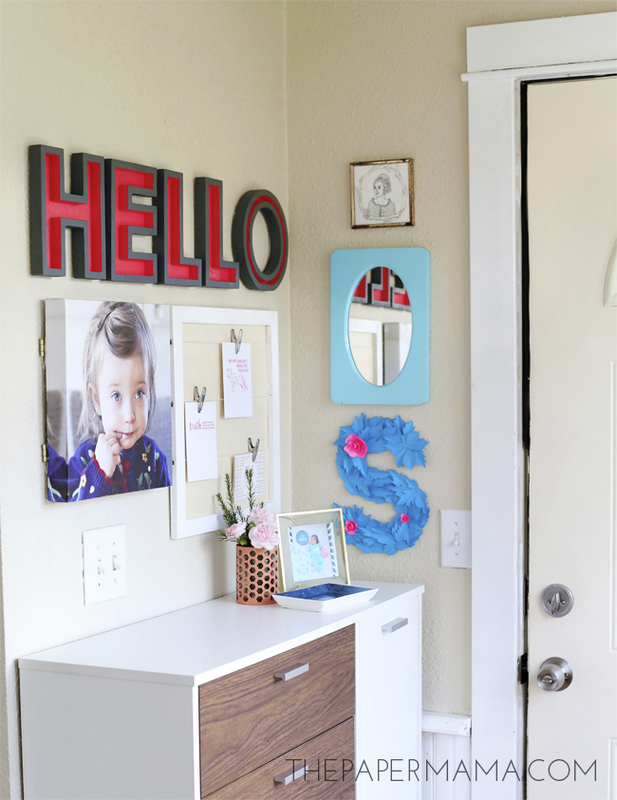 I have to say I’m so happy with how the Front Entryway Makeover turned out. So much better than before. 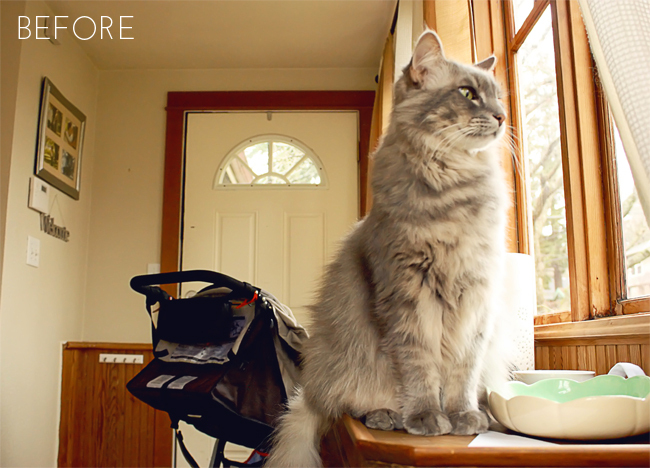 Speaking of before, it turns out I forgot to take before photos of the entry (I’m going to blame my mom brain), so I had to wander through my old photos to find something to show how it looked before the makeover. This photo was taken back in 2011 and the space looks so much better. I still want to paint the front door and walls, eventually. Have you finished any projects on your to do list lately? 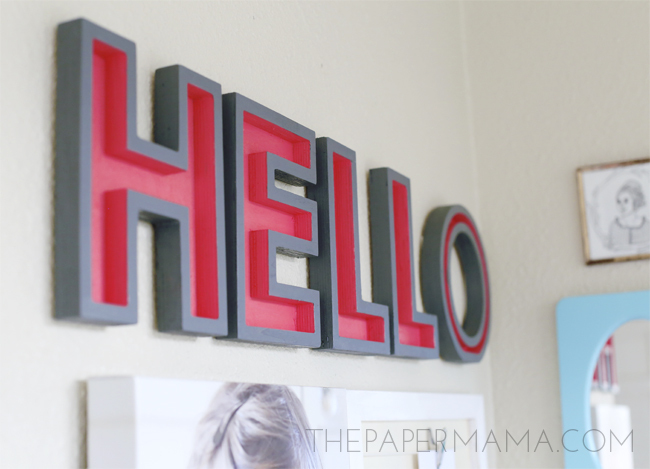 If you loved my “Hello” project, take a look at some of the fun projects on Michaels.com or the other 49 Makers’ ideas on The Glue String for to see how they personalized their crafts! P.S. 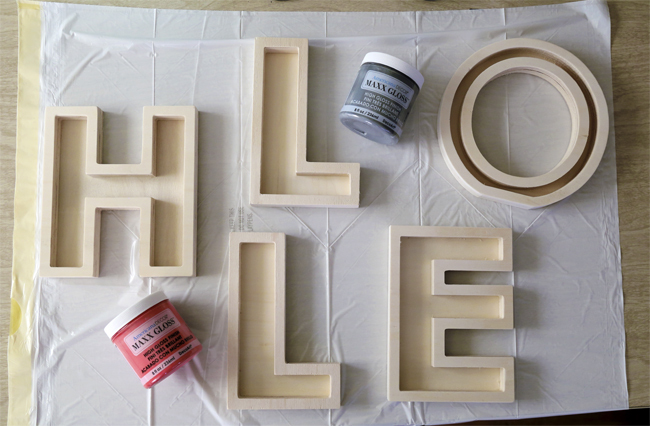 Michaels provided me with a store gift card to share this blog post with you. The best part about crafting is putting your own spin on a project. Whether it’s decorating with marquee lights or crafting an initial that represents your family name, Michaels has made it easy with their new Alphabet Soup by Make Market™ line of products. 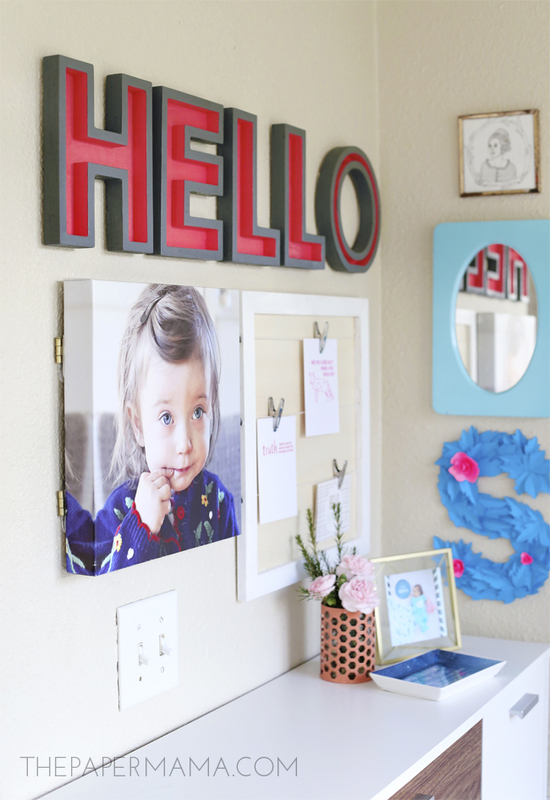 This collection of surfaces, letters, frames and more come in modern, eclectic or rustic styles. From natural and finished woods, to a variety of metals, resin and patterned styles, the possibilities are endless.